Manufactured in Nanjing, China, the DM 75 is suited for rotary drilling of 9- to 10-5/8-inch (229 to 270 mm) holes, with low and high pressure compressor options. The component layout and spacious electric over hydraulic cab are taken directly from its big brothers in the DM line. Having already been put to the test in Eastern Europe, the DM 75 is ideal for drilling in hard rock applications such as iron ore and copper. In its first test in such an application, the DM 75 has averaged a controlled 8,000 to 9,000 meters drilled per month at a 95% availability rate. Offering 34 tonnes (75,000 lbf) of pulldown, the DM 75 has a maximum depth capacity of 51.2 meters (168 ft). With a weight ranging between 68,000 to 85,000 kg (149,600 to 187,600 lb), the DM 75 offers a smaller overall footprint than its PV-275 counterpart. 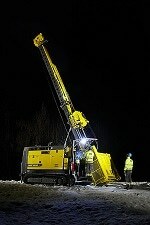 The first drill configured for export was a standard machine sent to a customer in Eastern Europe. In March, the DM 75 began production drilling 8,000-9,000 meters per month, which was a controlled depth by the contractor and mine. During this test, the DM 75 averaged 600 engine hours per month with an availability of 95%. The DM 75 is available with either an electric or diesel engine. This particular machine had a diesel engine, and averaged about 80-90 liters of fuel per hour.